Here is the secret of the frozen-ball shot reduced to a minimum. 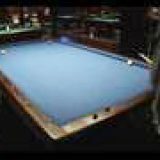 How often can you run the 8-ball the rail past the side pocket and into the corner? Two or three times out of ten tries would be commendable for the uneducated. Now that you know the secret of hitting the rail slightly first, you should be able to make it seven or eight times out to ten. (I just tried it and made nine out of ten, and I’m not a great shotmaker. 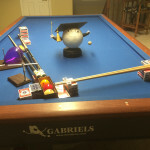 )The cueball will carom off the 8-ball roughly as indicated by the solid line. Why this works is explained on page 24 of Byrne’s Advanced Techique in Pool and Billiards (1990). 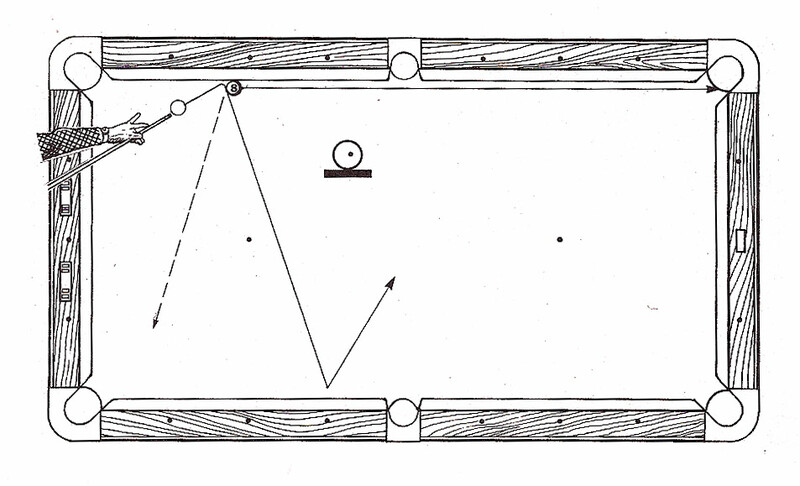 The shot is also makeable by hitting the 8-ball and the rail at the same time using outside (left, in this case) English to eliminate the throw effect. This approach brings the cueball off the rail along the dashed line. 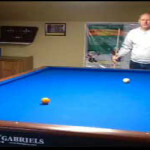 Throw is eliminated by outside English because the cueball rolls off the object ball instead of rubbing against it during the millisecond of contact.